Joint Warrior (JW) Exercises are planned and conducted by the Joint Tactical Exercise Planning Staff (JTEPS) based at Headquarters Northwood. JTEPS which is a joint organisation parented by both HQ Air Command & Navy Command (NC HQ). A typical JW includes between 20 and 30 Naval participants, including aviation, surface and sub-surface units. In addition around 75 aircraft participate, representing a wide variety of air power capabilities including fast air, Intelligence Surveillance Target Acquisition and Reconnaissance (ISTAR), Maritime Patrol Aircraft (MPA) and Command and Control (C2) assets flying at a daily rate of approximately 100 sorties. Ground based air defence (GBAD) units are also regular participants. JW regularly attracts participants from all major European nations, the United States, Canada, New Zealand and Australia. A period of formal Operational Sea Training (OST) is normally required prior to the Exercise for navies who do not regularly participate in JW. JWs can, if required, utilise the whole of the UK including the surrounding seas and airspace. Maritime play is traditionally concentrated off the NW of Scotland where a freedom to manoeuvre in both deep and shallow water, coupled with a limited civilian population, air and sea traffic offers excellent training opportunities. Other influencing factors include access to the weapons ranges around the coast of Scotland as well as other bespoke areas for Naval Gunfire Support (NGS) and Close Air Support (CAS). Air participants have access to the overland flying areas throughout the UK such as Spadeadam Electronic Warfare Training Range, and oversea training areas including 2 large Fast Jet Areas (FJAs) for air-to-air training off the North and West coasts of Scotland. JW is designed to provide interaction between forces and to maximise the synergistic training opportunities offered by having many different military capabilities working together that would only otherwise be found on live operations. The training to be undertaken within each JW is based on higher level direction from Air Command & Navy Command as well as the training contracts agreed with individual participants or their national command authority. The force mix is developed to ensure a valuable training package for all participants. Emphasis during the Exercise is on Tier 2 basic and advanced joint tactical training. For each Exercise JTEPS promulgate a Joint Warrior Instruction Document (JWID), Exercise Directive and Exercise Instructions and comprehensive supporting documentation from a simulated CJTF and the associated command chain below. All training takes place within a coherent operational scenario; rules of engagement (ROE) and tasks are laid down by directives at the tactical level, these include the provision of Command and Control (C2) directives and guidance, from JTEPS, who fulfil the Exercise Control (EXCON) and HICON functions. JW consists of 2 phases. For the Maritime element the Combat Enhancement Training and Force Integration Training (CET/FIT) phase provides a series of prescribed training events which are completed in rotation by participants. The Operations Phase (OP), which generally takes up the entire exercise for Air, develops through a period of tension under tight rules of engagement into open hostilities with all aspects of warfare being practised. The length of each phase depends on training bids and overall Exercise design/requirement and is managed on a daily basis by EXCON. A multitude of Close Air Support (CAS) serials operating in a variety of areas. Available training includes Convoy Support, Time Sensitive Targeting (TST) and Urban CAS all supported by fast jets, Non-traditional Intelligence Surveillance Reconnaissance (NTISR), Air Surveillance and Control System (ASACS) units, E-3s and Forward Air Controllers (FACs) in Tactical Air Control Parties (TACPs). In addition, Composite Air Operations (COMAO), Offensive Counter Air (OCA), Defensive Counter Air (DCA) and High Value Airborne Asset (HVAA) training serials can also be facilitated. Maritime Patrol Aircraft (MPA) participate in Anti-Submarine Warfare (ASW), Anti-Surface Warfare (ASuW) (including direct interaction with maritime units) and also, where appropriate, ISR missions. The Exercise also provides training for a significant array of other supporting Air assets, including Air-to-Air Refuelling (AAR), Airborne Early Warning (AEW) units and Electronic Warfare (EW) platforms. Training tasks are supported by a variety of fixed and mobile targets such as ‘inflatable scuds’ and EW emitters simulating surface-to-air missile (SAM) threats. Access to the EW range at RAF Spadeadam can also be provided. NGS, small arms and missile firings, both on the ranges and, where feasible, against fast inshore attack craft (representing asymmetric terrorist threats) and other surface units. MSO and MIO training opportunities are also high on the agenda. Mine Countermeasure (MCM) training - vessels gain practice in laying and clearing minefields in protection of themselves and their task groups. Submarine training - boats having the opportunity to take advantage of deep-water areas for sub-vs-sub warfare and participate in sub-vs-ship warfare and TLAM exercises. In opposition, all ASW capable participants gain experience in tracking and, where tasked, integrating with the submarines. Anti Air Warfare (AAW) exercises and Amphibious operations in partnership with Air and Land assets. Tactical development and Trial periods. Land participation within JW is scalable and can range from small groups of FACs up to Battlegroup level deployments. Training is conducted on a variety of live ranges, military training areas and private land (with the permission of the land owner). The majority of participants use the exercise as Pre-Deployment Training (PDT) or Mission specific Training (MST) prior to going on operations as it provides an opportunity to conduct live training in a realistic multi-threat environment using scarce assets. Media Exercise press team (Ex-press) visit as many participants as possible. The team provides effective media training with interviews conducted on camera, in person and by phone or radio. These interviews allow the creation of exercise newspapers, press releases and simulated TV programmes, all of which help enhance the ongoing scenario. During JW a Multi-national Joint Logistics Centre (MJLC) ensure the training momentum for units is maintained by coordinating all operational logistics and sustainability issues including Replenishment At Sea, delivery of all high-priority items to rectify operational defects and the management of personnel moves including casualties and compassionate cases. Emphasis is placed on working as part of a multination logistics organisation and providing a connected flow of accurate logistics information up the chain of command. Logistic training serials can be arranged on request. JW facilitates high quality joint tactical training with maximum tactical interaction. Individual exercise plans are flexible and tailored to meet the participants’ individual and collective training requirements. The high fidelity Tier 2 joint training environment provided by JW assists the participants to train in or prepare for operational tasks undertaken around the world. The vehicle deck of HMS Bulwark in preparation for Joint Warrior. Image by LA(Phot) Dean Nixon. 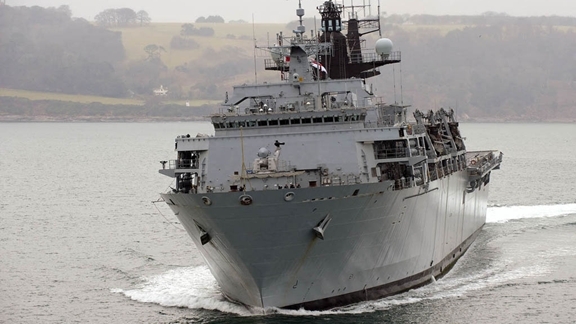 HMS Bulwark taking on vehicles in preparation for Joint Warrior. Image by LA(Phot) Dean Nixon. A mexeflote manned by 17 Port and Maritime takes on vehicles for Joint Warrior. Image by LA(Phot) Dean Nixon. A mexeflote manned by 17 Port and Maritime carries vehicles to RFA Lyme Bay for Joint Warrior. Image by LA(Phot) Dean Nixon. HMS Illustrious sailing from Portsmouth for Exercise Joint Warrior. Image by Samantha Chapman. As warships and aircraft from across the Royal Navy begin a huge maritime exercise off the coast of Scotland, HMS Diamond has been gearing up for her role with a series of training drills. The Portsmouth-based Type 45 destroyer has been putting her sailors to the test as she sails to meet the rest of the Task Force near Cape Wrath for a Combined Amphibious Landing Forces Exercise later this week. HMS Diamond, which is affiliated to the cities of Aberdeen and Coventry, is to provide the air defence role for the exercise â which will see Royal Marines storm the remote area by landing from the sea and air under the cover of warship firepower. âThe Marines will be going ashore from HMS Illustrious and Bulwark to carry out their assault on land,â explained Principal Warfare Officer (Above Water), Lieutenant Ben Martin. âAs well as keeping an eye on the airspace, we will attack enemy positions on land by providing naval gunfire support from our 4.5 gun as they arrive on the ground.â To prepare for this role, the warship has been taking part in a number of smaller scale exercises including practising firing at a moving target. For this, JTEPS release a remote controlled dummy craft that acts as a small fast boat â or Fast Inshore Attack Craft â for all the ships in the task group to fire on. âThe aim is to disperse the craft â if we hit it then it is a bonus,â explained Midshipman Annabel Broad. âIt is really about working with other nations â we all get a feel for how the other operates and it helps makes relations stronger for when we work together in the future.â As well as conducting the larger scale gunnery and air defence exercises, HMS Diamondâs shipâs company regularly practise their firefighting and damage control routines to make sure they are fully prepared for all eventualities. All the exercises are as real as possible â with smoke machines used to severely limit visibility and personnel given strict time limits. Images captured show members of the Royal Marine Surveillance Reconnaissance Squadron (SRS) conducting a low level parachute jump from a RAF Hercules aircraft. The Commandos were part of a forward insertion team and jumped from 800 Feet on to Braid Fell in Scotland as part of Exercise Joint Warrior 13/1. Photex of Joint Warrior task group 2013 With HMS Bulwark the Fleet Flagship leading. The task group was made up of ships from the UK, Canada and the Netherlands. Images captured are of Royal Marines from 42 Commando as they conduct aerial assaults from Royal Navy Sea King and RAF Chinook Helicopters on to enemy positions on Barry Budden training area, Scotland.